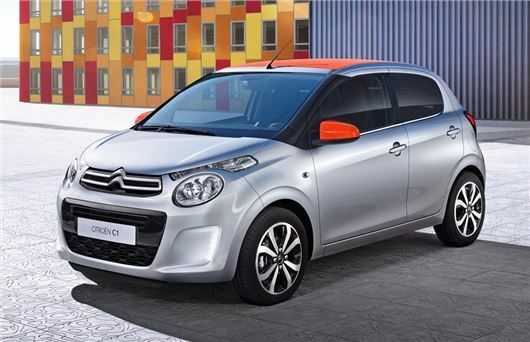 The new Citroen C1 will be priced from £8245 when it goes on sale this July. That gets you a C1 three-door in entry-level Touch trim with the 1.0-litre VTi 68PS engine. There are three unusually named trim levels - Touch, Feel and Flair with all models coming with power steering, remote central locking, ESP stability control, electric front windows, six airbags, a CD stereo with a USB socket and LED daytime running lights. The Feel trim adds air conditioning, DAB, a 7-inch Touch Drive interface with Mirror Screen technology and steering mounted controls, along with body coloured door mirrors and door handles. The top of the range Flair has 15-inch alloy wheels, a speed limiter and rev counter, a reversing camera, electrically heated and adjustable door mirrors, a leather steering wheel and dark tinted rear windows. Eight paint colours are available with four metallic options, along with three wheel designs and four interior upholstery finishes. The fabric roof will be available in three colours for the open-top Airscape models - black, grey and red. Two petrol engines are available in the new C1, both three-cylinder units. There's the 1.0-litre with 68PS that comes with a five-speed manual as standard or with a five-speed clutchless ETG has an option. Alongside is a 1.2-litre with 82PS. Optional extras include automatic air conditioning, automatic headlights, keyless entry and start plus extra styling details such as black leather upholstery and various interior colour packs.